After a great day with good spring weather we decided to visit a Port wine lodge in Vila Nova de Gaia. We went in to the Porto Cruz lodge and decided to have a tasting, and as my friends were new to the wide world of port I decided to have a tasting with broad range of port to show that port is a very wide concept. We got seven port, starting with the dry white, continuing with a few tawnies and ending with Cruz Vintage 2011 and Dalva Golden White 1963. We all agreed that we did not prefer the dry white but the decision between the old white and vintage was more difficult. It is astonishing that white port can transform from a quite mediocre wine (new on release) to a very complex and fantastic wine with age. We also learned that La Martiniquaise, the owner of Porto Cruz has bought the stock of Vasconcellos port from Christies. The brand of Vasconcellos remains with Christie’s. After the touristic Gaia lodges we decided to have a glas of nice vintage port in the fabulous port wine bar Vinologia. I was very disappointed to find that is was closed! On the outside everything looked at usual but looking through the window we say a pile of letters inside and that everything was abandoned. However, we were lucky to get directions to the new location. It is just 30 meters down the street towards the river but there were no signs to the new place. We entered the new location, Portologia, and I wanted to find a vintage port we had never tried before. As I was looking at bottle of Quinta de Lamelas Vintage 2010 I said half aloud to myself “I wounder if we have tried this vintage” and as a reply I heard “yes, you had that the last time your visited us”. You cannot imagine my surprise when Maria at Portologia told me that she often uses our web site and knew that we had this particular vintage in September 2014. I was deeply impressed. Few, if any, wine bars has such an amount of vintage port to offer and after some discussion we found a vintage we had not sampled before, Quinta de Val da Figueira Vintage 2007. It was very good. I also had the opportunity to try the 2011 of the same quinta. However, the 2007 was better. Maria really provided a spectacular service and made us feel very welcome. We do recommend that you visit the new Portologia at your next visit in Porto. 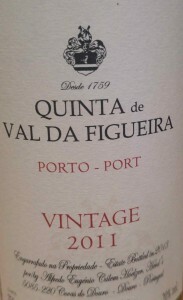 This entry was posted in Tasted Vintage Port, Travel and tagged 2007, 2011, Cruz, Portologia, Quinta de Val da Figueira on April 28, 2016 by Stefan.